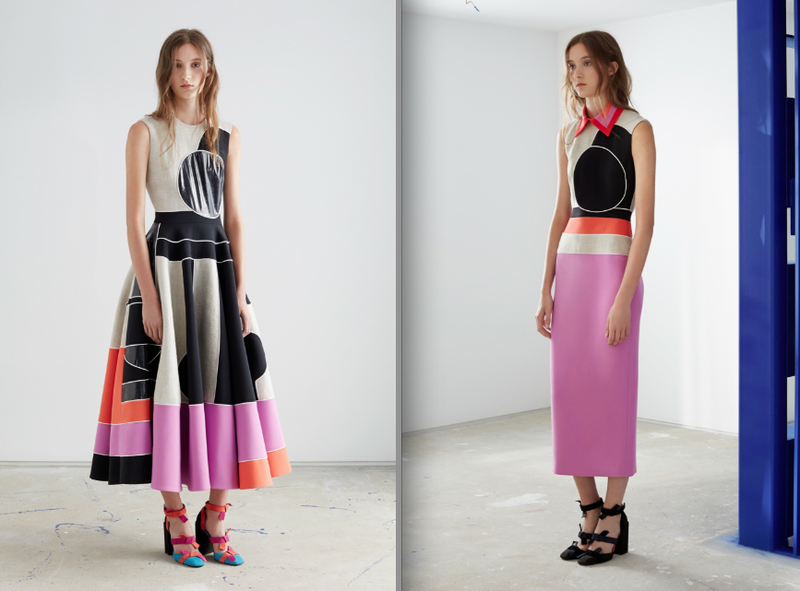 These two fashions from the Roksanda Resort 2016 collection are two fashions that I greatly admire. They are fashions that encompass a geometric modernity, bold colorations, and a subtle hint of a solar eclipse in the breathtaking, wondrous sky. In these fashions, shapes and hues come together in an effortless way. The blocked colorations of black, off-white, white, pink, orange, and red create a contemporary design and structure that is simply marvelous. As you look at the dress with the a-line skirt (image left), you see rectangles, circular figures, and more, with defined, yet united edges–they are shapes that fit together as if puzzle pieces, they are shapes that collectively link. As you look at the dress with a form-fitting three-tiered skirt (image right), you see wraparound pinks, off-whites, and oranges creating a fantastic, vivid linkage of artistry–the smooth fabrics connect seamlessly. There is this celestial atmospheric beauty to these fashions, circular orbs of moon-like appearance that bespeak to the extraordinary eclipses of the sky. In both fashions, a circle, a transformative moon, appears in all its enchanting glory. In the dress on the right, the eclipse boldly shows amid a backdrop of dark and light hues–the moon blocks the glowing solar light and materializes into a pitch black circle. The thin white borders surrounding the orb become the hints of the sun peaking around the moon, radiating in the Earth. In the dress on the left, it is as if the eclipse begins to disintegrate in a fascinating, otherworldly, magical way. The sphere embodies a mixture of black, gray, and white colorations that stretch and elongate, undergoing a mystical change–a change that leads to something unknown, a change that shows how vast and remarkable our universe truly is.